2019 Ford F150. 2” Front Leveling Lift Kit for 2004-2019 Ford F150. Can be installed in about 1 1/2-2 hours and does not require strut/coil disassembly like other kits. They are CNC machined out of billet aluminum and then powdercoated black to match you factory suspension. 3” Front and 2" Rear Leveling Lift Kit for 04-14 F150. 2014 Ford F150 4WD 2WD. Can be installed in about 2-3 hours and does not require strut/coil disassembly like other kits. Fits Ford F150 2005 Ford F150 4WD 2WD. 1999 (MARCH & AFTER) -2004 FORD F-250 F-350 Super Duty 4X4 4WD. WILL FIT FRONT LEAF SPRING MODELS ONLY. Will fit front leaf spring models only. 2" Front Leveling Lift Kit w/ U-bolts Fits 1999-2004 Ford F-250 Super Duty 4X4 Will work on front leaf spring 4WD only. Will work on front leaf spring 4X4 only. Will NOT fit Early January / February 1999 Models. 2019 Silverado 1500. 2019 Sierra 1500. 07-19 Silverado Sierra 2” Front Leveling Lift Kit. Fits Silverado Sierra 1500 Can be installed in about 1 1/2-2 hours and does not require strut/coil disassembly like other kits. So what do ya say?. Do you wanna be our friend?. Hit us up if you run into any issues at all, and we?ll make it right. We're here for you. Because we aren't just about the single sale here. We don't wanna just hit it and quit it, as a famous rapper once said. Trending at $152.99eBay determines this price through a machine learned model of the product's sale prices within the last 90 days. 3" Front 3" Rear Lift Kit w/ Shock Extenders Fits 2007-2018 Chevy Tahoe Suburban 1500 GMC Yukon 2WD / 4WD TRUCK PICTURED HAS 33" TIRES. They are specifically engineered to lift the advertised height. 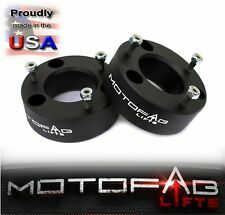 Rear 3" Lift 6061 Aluminum Billet Coil Spring Spacers. 2018 Dodge Ram 1500. 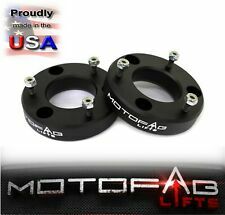 2.5” Front Leveling Lift Kit for 2006-2018 Dodge RAM 1500 4WD. Can be installed in about 1 1/2- 2 hours and does not require strut/coil dis-assembly like other kits.They are CNC machined out of billet aluminum and then powder coated black to match you factory suspension. 2019 Toyota Tacoma. 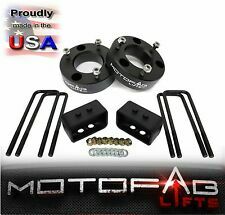 3" front 2" rear leveling lift kit for 05-19 Toyota Tacoma. Can be installed in about 2-3 hours and does not require strut/coil disassembly like other kits. Fits Toyota Tacoma 2005 Toyota Tacoma. Performance & Quality. Prove it? OK, LIFETIME WARRANTY. 2018 Ford F150. 2.5" Front Leveling Lift Kit for 2004-2018 Ford F150. Can be installed in about 1 1/2-2 hours and does not require strut/coil disassembly like other kits. They are CNC machined out of billet aluminum and then powdercoated black to match you factory suspension. 2019 Silverado 1500. 2019 Sierra 1500. 3” Front and 2" Rear Leveling Lift Kit for 07-19 Silverado Sierra. Can be installed in about 2-3 hours and does not require strut/coil disassembly like other kits. 4" Rear Lift Kit Blocks & U-bolts Fits 2007-2018 Chevy Silverado GMC Sierra 1500 2WD / 4WD. Rear 4" Fabricated Steel Tapered / Angled Lift Blocks. 5X stronger than cast iron blocks. Kit Information Suspension Specialists mission is to produce & provide the highest quality product at competitive prices! This kit features our High Performance N3 series stabilizer cylinders and includes all brackets and hardware. Rough Country Dual Steering Stabilizer System with N3 Performance Shocks. 2003-2012 Dodge Ram 3500 4x4 models. 2018 Dodge Ram 1500. 2” Front Leveling Lift Kit for 2006-2018 Dodge RAM 1500 4WD. Can be installed in about 1 1/2- 2 hours and does not require strut/coil dis-assembly like other kits.They are CNC machined out of billet aluminum and then powder coated black to match you factory suspension. 2018 Ford F150 4WD. 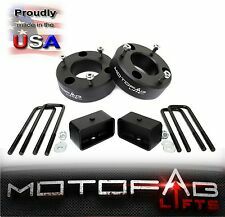 2.5” Front and 1.5" Rear Leveling Lift Kit for 09-18 F150. Can be installed in about 2-3 hours and does not require strut/coil disassembly like other kits. Fits Ford F150 2009 Ford F150 4WD. Leveling Lift Kit. CHEVY SILVERADO 1500 2WD. CHEVY SILVERADO 1500 4WD. GMC SIERRA 1500 2WD. GMC SIERRA 1500 4WD. and Rear Lift Blocks. 2 x Rear Lift Blocks. Pair of Billet Aluminum Lift Spacers. Note: This steering stabilizer kit fits 05-18 Ford Super Duty trucks with 2"-8" of lift. (2) Big bore steering stabilizers. Installation instructions. Mounting brackets. Reduces bump-steer. 2018 Dodge Ram 1500. 3” Front Leveling Lift Kit for 2006-2018 Dodge RAM 1500 4WD. Can be installed in about 1 1/2- 2 hours and does not require strut/coil dis-assembly like other kits.They are CNC machined out of billet aluminum and then powder coated black to match you factory suspension. The leveling kit you receive may have different height. 1994-2006 Dodge Ram 1500 (2WD). 1994-2011 Dodge Ram 2500 / 3500 (2WD). 2.0" Lift 2.5" Lift 3.0" Lift. 1994-2011 Dodge Dakota. 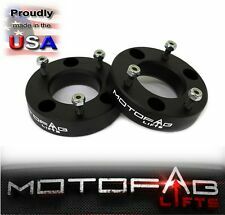 Quantity 2pc Lift Spacers. (2) Premium N3 Series shocks. This kit also includes a set of rear blocks. Rear lift blocks. Installation instructions. Levels the front with the rear of the vehicle. Front strut extensions. This new design utilizes our popular 2" Lower Strut Extensions combined with a set of upper strut spacers and rear blocks to achieve a total of 2.5" of lift - enough clearance to run up to a 285/70/17 tire - all at a price that won't break the bank! 2007-2018 Toyota Tundra 2WD/4WD. This kit is built to lift your truck without cutting or welding. It includes all the hardware and instructions for the do-it-yourselfer. This is completed with our fabricated steel tapered lift blocks and extended U bolts that finishes the look and clearance needed. Fits 2007-2019 - Toyota Tundra - 4WD. Fits TOYOTA TUNDRA. 3" blue FRONT 1" REAR COMPLETE leveling LIFT KIT. NOTE: Lift amount does NOT equal spacer thickness. Includes 2 Rear Lift Blocks. Includes 2 Front 3" Lift Spacers. 3” Front Leveling Lift Kit for 2004-2014 Ford F150. Can be installed in about 1 1/2-2 hours and does not require strut/coil disassembly like other kits. They are CNC machined out of billet aluminum and then powdercoated black to match you factory suspension. 2019 Silverado 1500. 2019 Sierra 1500. 07-19 Silverado Sierra 3” Front Leveling Lift Kit. Can be installed in about 1 1/2-2 hours and does not require strut/coil disassembly like other kits. They are CNC machined out of billet aluminum and then anodized black to match you factory suspension. 3" Front Leveling Lift Kit For 2005-2019 Toyota Tacoma. 2007-2008 FJ Cruiser 4WD. Can be installed in about 1 1/2-2 hours and does not require strut/coil disassembly like other kits. They are CNC machined out of billet aluminum and then powdercoated black to match you factory suspension. 3” Front and 2" Rear Leveling Lift Kit for 99-06 Silverado Sierra. Can be installed in about 2-3 hours. Fits Silverado Sierra 1500 1999 Silverado 1500 2WD. Fabricated lift blocks will out last cast iron and will far outlast solid aluminum rear lift blocks. 2004-2012 GMC Canyon 4X4 2WD Z71. 2004-2012 Chevrolet Colorado 4X4 2WD Z71. This kit is built to lift and level your truck with our front kit adjustable from 1-3" of lift. Our torsion keys are reindexed so you can properly lift your truck without overcranking your factory kits. 2019 Toyota Tacoma. 2" Rear Leveling Lift Kit for 1995-2019 Toyota Tacoma. This lift kit will raise your Tacoma by 2" in the rear. Can be installed in about 1 hour and includes instructions. Fits Toyota Tacoma. 2004-2018 Fits Nissan Titan 3” Front and 2" Rear Leveling Lift Kit. Fabricated lift blocks will out last cast iron and will far outlast solid aluminum rear lift blocks. The rear lift blocks are also powdercoated for a long lasting finish. Billet Aluminum is the premium choice material to use when leveling your truck, which is the solid single-piece construction. 2007-2019 GMC Sierra 15004WD / 2WD. 2007-2019 Chevrolet Silverado 15004WD / 2WD. 2002-2006 Chevrolet Avalanche 1500 4WD . ADJUSTABLE 1-3" FRONT TORSION KEYS 2" REAR LIFT SPACERS. Forged Billet Aluminum Rear Lift Coil Spacers Designed for Superior Strength. With 2.5" Shock Extender. 1" Rear Lift Kit Blocks with U-bolts Fits 2005-2018 Toyota Tacoma Pre Runner 6-Lug 4WD 2WD 2018 Models with Toyota Safety Sense (TSS) may experience error codes with any lift kit. Toyota is aware of the issue with lifted 2018 Tacomas but have not released a software update yet. $PART NUMBER: ESS100 ---Fits 1994 - 2002 DODGE RAM 1500 2500 3500 4X4 4WD ---3.9L / 5.2L / 5.9L / 8.0L (GASOLINE AND DIESEL) ---BRAND NEW STEERING GEAR BOX STABILIZER APPLICATIONS ---Fits 1994 - 2001 DODGE RAM 1500 3.9L 239CID V6 OHV ---Fits 1998 - 1999 DODGE RAM 1500 3.9L 238CID V6 OHV ---Fits 1994 - 2001 DODGE RAM 1500 5.2L 318CID V8 OHV ---Fits 1998 - 2000 DODGE RAM 1500 5.2L 318CID V8 SOHC ---Fits 1994 - 2001 DODGE RAM 1500 5.9L 360CID V8 OHV, VIN CODE "Z" ---Fits 1999 - 2001 DODGE RAM 1500 5.9L 360CID V8 SOHC ---Fits 1994 - 1996 DODGE RAM 2500 5.2L 318CID V8 OHV ---Fits 1999 - 2001 DODGE RAM 2500 5.9L 359CID L6 DIESEL OHV TURBOCHARGED, VIN CODE "6, 7" ---Fits 1994 - 1996 DODGE RAM 2500 5.9L 359CID L6 DIESEL OHV TURBOCHARGED, VIN CODE "C" ---Fits 1998 - 2002 DODGE RAM 2500 5. 2007-2019 GMC Sierra 1500. 2007-2019 Chevrolet Silverado 1500. Billet Aluminum is the premium choice material to use when leveling your truck, which is the solid single-piece construction. 2007-2018 GMC Sierra. Chevy Silverado 1500 Classic: 1999 - 2007 2WD only. GMC Sierra 1500 Classic: 1999 - 2007 2WD only. Chevy C1500, C2500, C3500: 1988 - 1998 2WD only. Chevy Suburban 1500, 2500: 1992 - 1999 2WD only. Chevy Tahoe 1500: 1995 - 1999 2WD only. Whether you are a heavy-duty off-roader or just want to give your car or truck a unique appearance, lift kits can be a great way to modify your vehicle to enhance its capabilities. Lift kits can vary in height from a fraction of an inch to several feet. Multiple types of lift kits are available to fit your exact needs. Body Lift Kits: A body lift is the simplest way to raise your car or truck. With this kind of lift, you essentially just install some spacers between the frame and the chassis of your vehicle. This allows you to use larger wheels and tires but does not improve the ground clearance. These lift kits can only be used with body-on-frame vehicles. Suspension Lift Kits: A suspension lift is slightly more complicated. It requires replacing all suspension components, including control arms, leaf springs, shocks, and struts to raise the vehicle's suspension. The upside to this approach is that it raises the entire vehicle, so if increased ground clearance is a priority, this could be a good choice. These kits also support big wheels and tires and can be installed on unibody as well as on body-on-frame vehicles. It's important to note that suspension lift kits can considerably change the ride of the car or truck. Leveling Kits: Most pickup trucks are designed so that the rear of the pickup sits higher than the front of the pickup, which makes it easier to haul large payloads. A leveling kit raises the front of the truck so that it is at the same height as the rear. Leveling can improve the aesthetics of your truck and may allow you to use bigger wheels and tires without considerably affecting the ride of the truck. What suspension parts are included in a suspension lift kit? A typical suspension lift kit comes with front and rear shocks, front coil springs, rear leaf springs, sway bar links, tubular control arms, brake line relocation brackets, and rear shackles. Depending on the vehicle's drivetrain, it may also include a transfer case drop kit. Suspension lift kits vary from model to model, so make sure that you purchase one that fits the model and year of your car or truck. What parts are included in a body lift kit? Body lift kits typically include spacers, a steering extension, and brackets as necessary to accommodate the lift. Body lift kits typically only exist for lifts of up to 3 inches and are available with as little as half an inch of lift.